Lava Man won the Pacific Classic Sunday at Del Mar, keeping us on course for a potential amazing clash at the Breeders Cup Classic this year between him, Bernardini, Invasor, and Flower Alley. 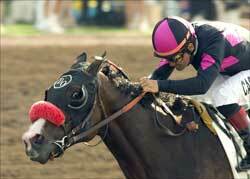 On pace to showdown with Bernardini in BC Classic. 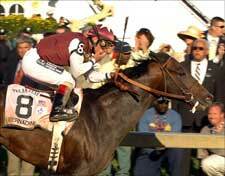 Lava Man is now 6 for 6 this year, and is also the first horse to ever win the "Big 3" races in Southern California in the same year: the Santa Anita Handicap, The Hollywood Gold Cup, and the Pacific Classic. Bernardini races this Saturday at the Travers Stakes, the main event of the summer meet at Saratoga which is also known as "The Midsummer Derby". He wil face six challengers, the sternest being Bluegrass Cat, who finished 2nd in the Derby and Belmont and easily won The Haskell in his last start. Bernardini has been flat-out awesome in his last 3 races; if he can do it again then there will be much hype about the showdown with Lava Man in the Breeders Cup Classic, with the standard East vs. West hype and whatnot. The Travers will be shown on ESPN on Saturday from 2-4 p.m. PST. Is Bernardini a freak or has his competiton just been poor?